Convicted murderer Mark Trex has just escaped from an asylum and is headed for New York City to track down the members of his favorite childhood band, Warriors of the Inferno. Believing that their occult hit song, which told of Satan and death, is true, Trex is determined to see if the band members have held up their part of their pact with evil. 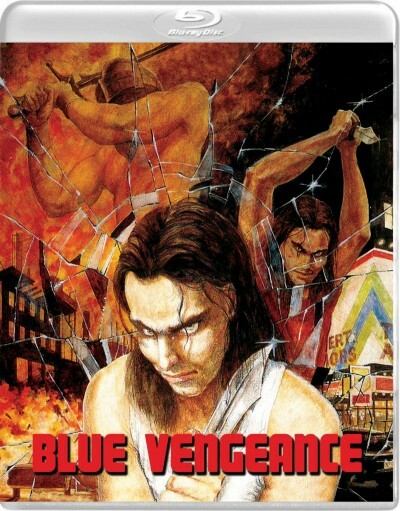 However, cop-on-the-edge Mickey McCardle is hot on his trail and determined to end this serial killer’s spree. A strange mash-up of horror and action film, J. Christian Ingvordsen’s BLUE VENGEANCE combines gory killings with drug addled underground rock club scenes and corrupt police procedure that’s set in the gritty world of late 80s New York, and comes complete with visits to Times Square and the infamous music club, CBGBs. Vinegar Syndrome presents the Blu-ray debut of this direct-to-video rarity, newly restored from its camera negative.